Order up! Many years ago, when I was in college, I worked at a vegetarian restaurant called Gaia Cafe. The restaurant is still open after almost 30 years, and the menu has changed very little over the years. When you have a good thing, why change it? It’s one of my favorite places for breakfast or lunch, with a cozy, eccentric vibe and self serve, fair trade, and strongly brewed coffee so you never have to wait for your server to deliver your morning buzz. If I didn’t cook all the time at home, I’d be a regular at Gaia–I sure do miss my almost daily meals there from my four years of serving. My favorite dish on the menu there is Cuban Eggs, Gaia’s version of Huevos Rancheros. After their decades of perfecting the recipe at Gaia, I’m not sure that I could ever create anything that surpasses it, but my homemade take on Huevos Rancheros really holds its own. Not to mention, it is a more economical breakfast for two, allows for every customization I could want (I’m looking at you, radishes, avocado and cheese), and spares us from trudging through the snow on a bitter January morning. Oh…and the coffee? It’s fair trade, brewed strongly, and all-you-can-drink self-serve in my kitchen too. And I can yell “order up!” just as loud as any line chef you know. 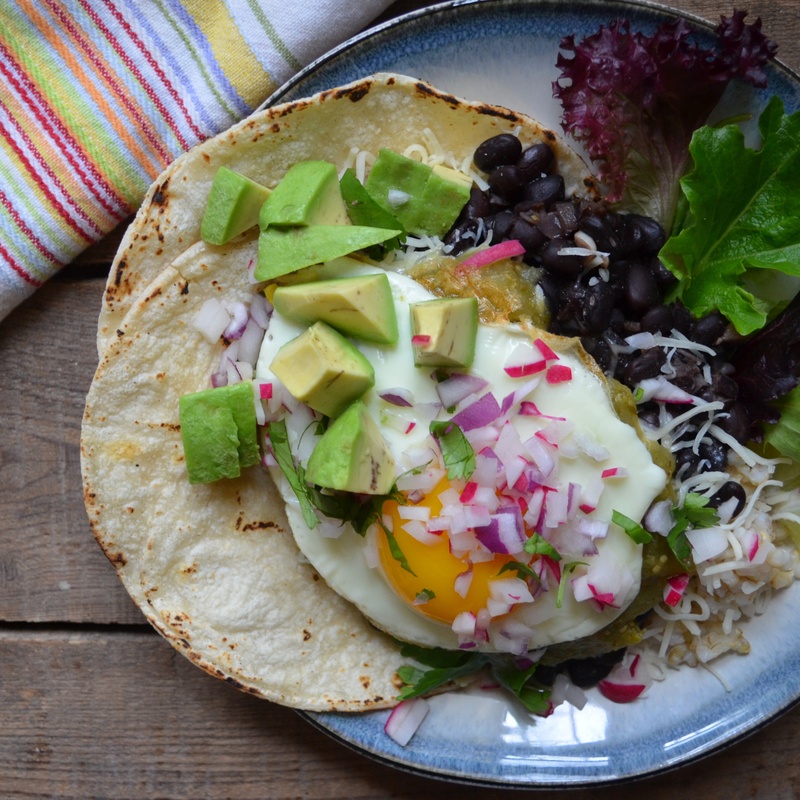 Now, I’m of the mind that you can eat Huevos Rancheros for breakfast, lunch, or dinner. Cooking Light Magazine agrees–if you want to further modify this great dish, try their take on Huevos Rancheros- in taco form. Prepare the salsa if you are using homemade: To prepare salsa, place tomatillos in a saucepan with water to cover and cook until soft, about 5 minutes. Drain and add to a blender with remaining ingredients. Pulse until it becomes a sauce–you can leave it a bit chunky or blend until smooth. Heat the tomatillo sauce: Pour homemade or store-bought tomatillo sauce into a small saucepan and heat on low. Prepare the beans: Heat oil in a skillet on medium and add garlic and red onion. Saute until translucent, 4-5 minutes. Add cumin, oregano, and beans. Stir to combine, and heat beans to a simmer. Turn to low to keep warm. Heat the tortillas: My favorite way to heat tortillas is over an open gas flame. Turn flame to high and carefully place a tortilla onto the flame. Let heat for about 10 seconds and, using tongs, lift edge to see if there is slight charring. If you see some light charring, flip over and char other side of the tortilla. Remove and continue with remaining tortillas. If you don’t have a gas range or don’t feel brave enough to try my method, heat a skillet on high and add one tortilla at a time, allowing to heat and slightly bubble, about 30 seconds. Flip to other side and heat for 30 seconds. Continue with remaining tortillas. Assemble plates: Place a small bunch of lettuces and two tortillas on bottom of each plate (or fold onto the side if you don’t want any sauce on the tortillas). Place 1/4 cup brown rice onto tortillas on each plate. Add 1/2 cup black beans to each plate. Pour 1/2 cup tomatillo sauce onto each plate. Divide cheese between plates and sprinkle onto the tomatillo sauce. Fry the eggs: Heat 1 tsp oil in a small frying pan (I use an 8 inch pan). Fry eggs until over easy or over medium, whichever you most prefer. Sprinkle with a touch of salt. Add one egg to each plate on top of the tortillas, rice, black beans, and tomatillo sauce. Top each plate with minced radishes, onions, cilantro, avocado, and sour cream. Enjoy: Serve immediately with hot sauce–I always have Sriracha, Valentino, Tapatio, and homemade habanero hot sauces on hand. Thanks! Hope to try your version…the best huevos ranchero I enjoyed was in Pueblo, NM, too long ago. This recipe looks Wonderful! Can’t wait to try it! Can you post the Tomatilla Sauce recipe? The link to it doesn’t seem to work. We also love the Gaia- their veggie hash is to die for! Thank you for all your hard work – your blog is really great! I love the Veggie Hash also–even though I know all of the ingredients it never tastes the same at home as it does there. They know how to do it right! And Rick has the pans, wok, right amount of heat, etc. that all comes together to make the hash what it is. I forgot to link to the tomatillo recipe–thank you very much for catching that. I just updated this post and revised it to add the tomatillo recipe right into the post. Thanks again! These look great. I love breakfast burritos because they are tasting and carry you through the day so well, but have never made them (successfully) myself. I will definitely be giving these a try. Thanks for the recipe. Thanks, Gabe! These will be easy, especially since you make such an amazing tomatillo salsa. Just do some black beans, rice (if you want), pour on some salsa, an egg, and top with whatever you want. I was going to try a pared down version of this as a taco (with over medium or scrambled eggs). I’m making these in about two seconds! Yum!